As a Charitable society , Samikhya promotes and catalyses education among underprivileged children, create the process to embrace these children into mainstream in sustained manner, facilitate them to emerge as productive assets, and set the foundation for nation building. To bring about social equality by providing education to the deprived and weaker sections of the society. 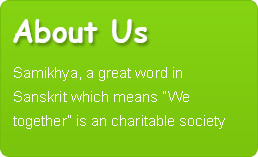 To be a service oriented organization and work for the upliftment of the poor and needy. To extend its service activities in various sectors i.e. medical aid, blood donation etc. Integrity: We take accountability for our actions by being honest, transparent, ethical, reliable and legal. Compassion: We demonstrate compassion and care for people who are most in need. Collaboration: We build effective working relationships with other organizatons and strong partnerships within the community. Dignity: We respect the inherent dignity of every person, for we believe that all human beings are equal irrespective of caste, creed and religion. Equality: To value, respect and support, every organization and each members equally. Every member should commit themselves for the keeping up with the core values of the organization.